It’s time for another Bundt cake! And for this month’s BundtaMonth the theme is Boozy December so my mind instantly turned to rum and raisin. It’s a classic combination, at least in the Caribbean. Ask any Trinidadian. Rum is an essential part of many of their recipes from black cake to rum punch to ice cream. Indeed, rum raisin is one of their most traditional ice cream flavors. Also, my current liquor cabinet, which is an 8-inch space of cabinet in my kitchen, is extremely limited to what was purchased upon entry in Duty Free. Here in Dubai, you cannot buy alcohol until you have a liquor license. And you cannot get a liquor license until you have a resident’s permit. And you cannot get a resident’s permit until you can stay in the country for three weeks at a stretch because you have to surrender your passport to the relevant authorities. And my dear husband was only here a couple of days before he was off again to Paris. So, without further ado, I give you this rum raisin Bundt cake with loads of rich butter, topped with a rum honey glaze. I made this for the lovely real estate agent who helped us get settled in our house. She went beyond the normal call of duty, even taking me to buy snacks at the grocery store on the day that I was waiting around in an empty house without transport or telephone for the airfreight and rental furniture. She deserved a cake filled with booze and gratitude! When I sent this home with her whole, my only request was that she send me some photos when she cut it, so the last photo is hers. If you need a recommendation for a real estate agent here in Dubai, just let me know. She is wonderful! Put the raisins in a small bowl and pour half of the rum for the cake over them. Allow to soak until all the rum is absorbed by the raisins. (This can be done a day ahead to save time on baking day.) Hide the bowl in the refrigerator or passersby will keep pinching raisins out of your rum bowl. Or was that just me? Anyway, better to put them out of sight. When you are ready to proceed, preheat your oven to 350°F or 180°C. Thoroughly butter or spray your Bundt pan with non-stick spray and then coat it with a little flour. In a medium size bowl, mix together your flour, baking powder, baking soda and salt. Set aside. In a large mixing bowl, use electric beaters or your stand mixer to cream together the sugar and butter until light and fluffy. Add in the eggs and egg yolk and vanilla and beat again until blended. Don't forget to scrape down the bowl with a rubber spatula. Add in the rum and beat again. Don’t be alarmed when the batter looks curdled. As we add in the flour mixture that curdled look will go away. Add about a third of the flour mixture to the batter, along with a third of the cream. Beat until just incorporated and then add another third of each. Continue the process with the last third of flour mixture and cream. Fold in the rum soaked raisins. There might be a little rummy raisin juice in the bowl. Hum that in too. Spoon your batter into your prepared Bundt pan, then smooth out the top with your spatula. Bake in the preheated over for 55 to 60 minutes or until a long wooden pick inserted in center of cake comes out clean. Mine actually took closer to 70 minutes. Cool in pan for 10 minutes. Remove from pan and cool completely on a cake plate. When the cake is completely cool, put the honey, rum and butter for the glaze into a saucepan. Turn on the fire on low and mix together as the butter melts. It may already start to bubble. After a minute or so the fumes from the rum should have evaporated and you can turn the heat up a little. We don’t want a fire here, folks. Boil the mixture for three to four minutes, stirring constantly. If you have a candy thermometer, you are looking to reach a temperature 240-248°F or 115-120°C. If you don’t have a candy thermometer, not to worry. Remove from heat and stir to cool slightly. Not too long or the glaze will begin to harden and you will have to eat it like candy and start over. While I realize that many of you won’t have a problem with this, I just wanted to warn you. Use a spoon to ladle the glaze over your completely cooled cake. Do not poke it with your fingertips because you will leave print marks behind in the shiny, shiny glaze. Give this cake to someone who deserves a special treat or share it with someone you love. Because it’s just that wonderful. BundtaMonth is the brainchild of Anuradha of Baker Street and Lora of Cake Duchess. And they would love for you to join us. Have a look at all the lovely boozy Bundts we have baked this month! - Get inspired by your favorite cocktail, mocktail or just use your favorite liqueur and bake us a Bundt for Boozy December. - Post it before December 31, 2012. - Link back to both Lora and Anuradha’s announcement posts. Follow Bundt-a-Month on Facebook where we feature all our gorgeous Bundt cakes. Or head over to our Pinterest board for inspiration and choose from over 350 Bundt cake recipes. The past couple of weeks I have had so many lovely comments and Facebook messages from folks who keep telling me how organized I am. And mostly I am. Really. But I dropped the ball on this one. 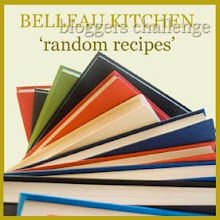 When it came time to make the dish for this month’s Random Recipe, where Dom from Belleau Kitchen challenged us to use our birthday day to choose a cookbook off of our shelves and then let that book open to a random recipe, I ran into a small problem. Hands up all of you who know where my cookbooks are! Yep, in the sea freight. Now what? As you might have read way back here only two books with recipes come in the suitcase. So, I grabbed my Good Housekeeping and opened it randomly. Then I counted forward to the 23rd recipe. And it can’t get any more random than that with only one real cookbook to choose from. Sorry, Dom! Hopefully by next month, my cookbooks will be here. I ended up in Poultry and the 23rd recipe called for boneless chicken breasts with heart-stopping amounts of butter. And then cream! This dish was so rich and delicious that I suggest you cook it for anyone you want swooning in your arms. Let’s just call it love and not a heart attack, okay? The original recipe called for eight chicken breasts but I cooked only four (well, my pack ended up being three and two little ones) and left all the other ingredients exactly the same, because we like sauce. Feel free to add the extra breasts if you have more people to feed. 8 oz or 225g mushrooms, cleaned – I used Swiss browns. Cut the hard ends off of the mushroom stems and then slice them. Set aside. Rinse the chicken breasts and then dry them between some paper towels. Melt three-quarters of the butter in a skillet over medium-high heat, along with a small drizzle of olive oil. Slide the breasts in and cook until browned on both sides. They will not be cooked through so don’t be alarmed if they are still pink on the insides. Remove to a plate. Add the mushrooms and the rest of the butter to the pan. Cook until the mushrooms are golden. Remove mushrooms with a slotted spoon and set them aside in a small bowl. Turn off the fire and stir the flour and salt into the pan drippings. Use a whisk, if necessary to make sure there are no lumps. Gradually stir in chicken broth and cream and then cook over a medium heat, stirring constantly, until mixture is thickened. Return the chicken and mushrooms to the pan. Pour in any chicken juices that collected on the plate. Reduce the heat to low and simmer for 25 minutes, with the lid on. Serve over rice or noodles. Add the green onions for garnish, if desired. 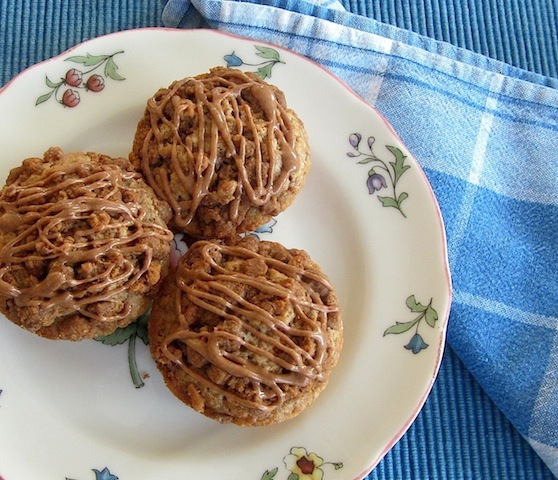 These cinnamon gingernut muffins are baked with gingernut biscuits inside and as topping for the tender sweet and spicy muffin below. Add cinnamon glaze for an extra kick! We are settling in nicely to life in our new house here in Dubai and I am delighted to tell you that I have met some of my neighbors. Lovely couple with two adorable children and, even as I type, a day-old newborn boy! I brought them over some of these a couple of days back because they love cinnamon and pregnant ladies can’t eat enough. Am I right? But let’s get to the topic at hand today, which is muffins! Originally, I wanted to add gingernut biscuits to last week’s muffin because, as you might recall, the recipe was banana bread and I thought the ginger biscuits would go so nicely with the banana. And then the little grocery store next to the hotel apartment didn’t have gingernuts. Sure, it had every OTHER McVitie’s variety but not the one I wanted. And that’s when the Bananas Foster muffin brainwave struck. I had rum from Duty Free. And I had the bananas! I bought some brown sugar and was on my way. Which left the gingernut idea still kicking around, waiting for a chance to be made. And when this week’s muffin recipe hit my inbox and it was a cinnamon centric muffin, I knew its time had come. Because what goes better than cinnamon and ginger? Exactly nothing, that’s what! And to add to my excitement, I had traveled from Cairo with a bag of cinnamon chips in my suitcase because I had found it at the store right before I left and I couldn’t leave it behind. I just couldn’t. So I added on a crumble topping made with more crushed gingernut and extra cinnamon chips. And then, since we are in the Holiday Series, TOPPED the topping with a cinnamon glaze. I tell you truly, folks, these were good! If you like cinnamon and ginger. Preheat your oven to 350°F or 180°C and line a 12-cup muffin pan with paper liners or grease it lightly. Pop your gingernut biscuits into a baggie and crush them with a rolling pin or the handy dowel you used to make pecan pie baklava last week. Not too small! You want some chunks. Put half the crushed biscuits in a bowl with the other topping ingredients. Use a pastry blender or two knives to cut the butter into the dry ingredients to make a crumble. Set aside. Put the remaining crushed biscuits in a large bowl with the rest of the dry muffin ingredients: the flour, sugar, baking powder, salt and cinnamon. Stir to combine. In a smaller bowl, whisk together the eggs, milk and melted butter. Pour the wet ingredients into the dry and mix until just combined. Fold in the cinnamon chips. 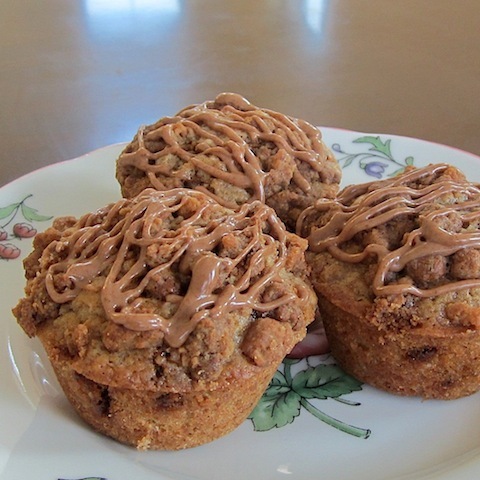 Divide the batter into your prepared muffin tins. Sprinkle each with topping, break it apart with your fingers if need be. Press in lightly. Bake the muffins for 20 to 25 minutes, or until they're golden brown. Remove them from the oven, and let them cool for five minutes before transferring them from the pan to a rack to cool. These smelled so good baking that I ate one hot, before the glaze. So sue me. Meanwhile, mix your one tablespoon of yogurt with the teaspoon of cinnamon and icing sugar to make the glaze. It looks too dry at first but just keep stirring! Icing sugar is a magical substance that turns runny with very little liquid. Once your muffins have cooled completely, drizzle them with the glaze. You can do this with a spoon but the glaze goes farther if you use a piping bag with a small tip. Enjoy! And bring some of these to your neighbors today! Pregnant or not, they'll be grateful. 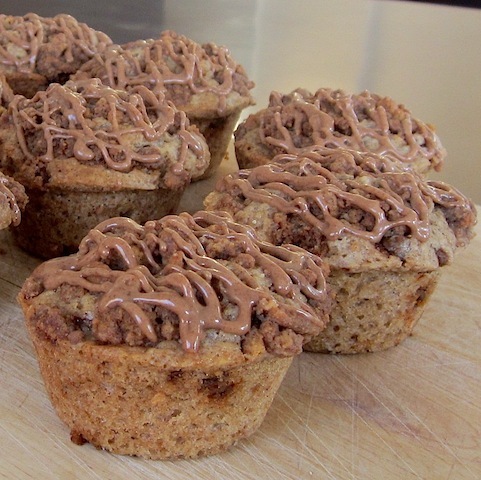 Pin these Cinnamon Gingernut Muffins!